Over 100 ornamental and historiated initials and a lavish use of gold make this into a luxury volume, likely made as a special commission. The extensive biblical imagery and lively repertory of ornamental elements continues a continental tradition that reached the British Isles in the 1220s, where it was further developed in urban workshops. The text includes the prologues by Saint Jerome. 239 x 163 mm. – 440 leaves, 66 ornamental and 57 historiated initials. Over 100 ornamental and historiated initials and a lavish use of gold make this into a luxury volume that was available only to the wealthy. The lively ornamental elements of beasts, dragons, and human figures continues a continental tradition that was developed further in Oxford, Salisbury, and elsewhere from the 1220s onwards. Consisting of more than 400 leaves, finely written in a small script yet readable throughout and with exuberant illumination (especially ff. 4r and 358r), this manuscript refers to an experienced scribe whose compact hand seems close to that of the Bible of William of Hales (Salisbury, 1254, now London, BL, ms. Royal 1 B XII). As the illumination is also related to work in that grand book, the manuscript may possibly be a Salisbury codex, although an Oxford origin cannot be excluded either. Among the numerous illustrations the engaging, abstract Creation miniature stands out. Hybrid figures at numerous historiated initials intermingle with narrative scenes. The lavish use of gold in the illumination is remarkable. Even though, in towns such as Oxford, Salisbury, and London, we know a great number of illuminators' names, only very few of these (often urban professionals flourishing in family workshops) have left identifiable works. Nevertheless, the edifying illustrations were and still are highly appreciated. In some details of its textual organization, the book represents a transitional stage, as chapter numbering is added in the margins rather than within the text, and the dictionary of the Interpretation of Hebrew Names is absent. Both the use of chapter divisions and dictionary are usually found in Bibles made after c. 1230s. Arranged as a single volume of ca. 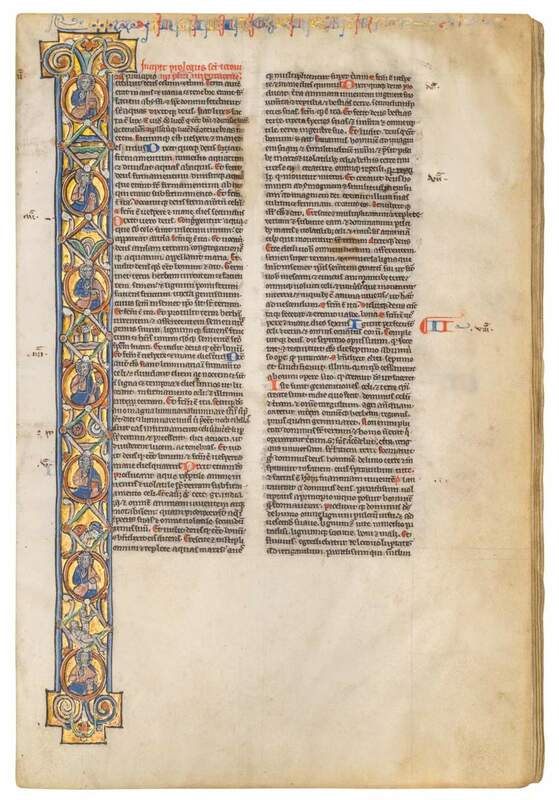 240 x 165 mm, this codex is larger than the Parisian “portable” bibles, but follows the order of books in the Paris Vulgate Bible, and includes the set of 64 prologues (in fact now 58 due to missing leaves). With wide margins throughout, the manuscript intriguingly shows instructions for the illuminator and corrections (often erased) by a corrector, which were then added by a scribe and surrounded in red outline. Some learned notes and remarks reveal an attentive reader: the added notabilia were intended to draw readers' attention to remarkable passages in the text.